THE most important attribute of a capsule wardrobe is versatility! Or as I like to say, mixability. Each piece of clothing must have double or triple duty to keep your wardrobe fresh. 1. 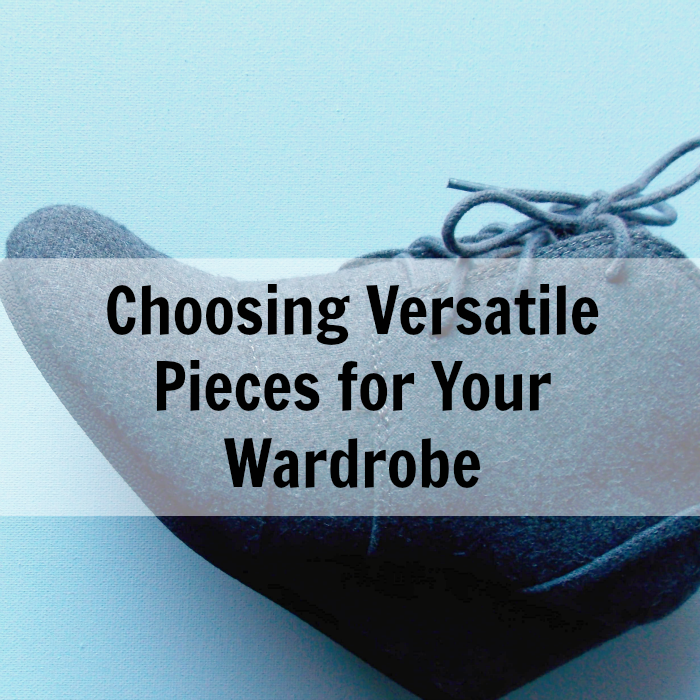 A versatile item will play nice with other items in the closet. In other words, it can be paired with almost everything else. If it's a top, it can be worn with most of the bottoms. If it's a bottom, it can be worn with most of the tops. If it's a dress, it needs to be able to stand alone, but also partner with sweaters, tops, jackets and scarves. If a piece is too outlandish or is the only one in your wardrobe that doesn't go with anything else ~ it's not versatile. It plays alone. You don't want a wardrobe made up of those types of pieces because you will not be able to mix and match. 2. A versatile item must have flexibility. It should be able to be worn dressed up or down. Even a fancy shirt can be dressed down with a cotton skirt and sandals. A suit coat can relax with jeans and booties. Dresses with great lines can also be dressed down with tennis shoes or Toms. If certain clothing items don't have flexibility then it's good to re-evaluate why you have them. If you keep a dress or tux for a formal dinner each year, then possibly you need to hang onto it. BUT if you could replace that piece with one that had some flexibility ~ you'd get much more use out of it. More wear for your money! 3. A versatile item must harmonize with other colors in the wardrobe. You get the idea, they need to somehow connect and work together. When forming a capsule wardrobe, you want lots of pieces that are highly versatile. This gives you creative license to mix and match each piece and keeps your outfits fresh without wasting money or harming the environment. Guilt-free style! What's your favorite work-horse item? Like more tips? Sign up to get 10 Steps to a Capsule Wardrobe sent to you right now! Black skinny jeans. Can be dressed up for work or a night out, can be dressed down for hanging with the kids and grocery shopping. LOVE black skinny jeans! That's one of my workhorses too, Kimberly. Thanks for the education, Catherine. I've never heard of a "capsule wardrobe." Great concept. Makes sense. I have to rethink my current wardrobe and future purchases (I do tend to think when considering a purchase, what I already have that I can put with it, e.g., pants with a top or tops with a pant).